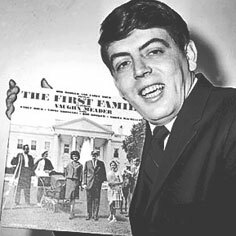 Vaughn Meader's First Family comedy album was the Grammy Award winner Album of the Year in 1962. While the First Family album satirized the Kennedy clan in High Fidelity stores, the first Studebaker Avanti models wowed pedestrians as the cars cruised by outside. 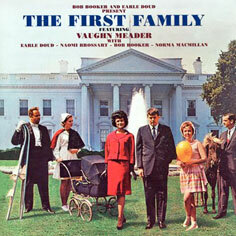 The First Family became the fastest selling record ever. In the four weeks after its release in 1962, the album sold 4 million copies, a figure it took the "My Fair Lady" sound track, the previous all-time best seller, one year to achieve. About 7.5 million copies sold and perhaps millions more were given away after the president's death. The album's sensational popularity also boosted Cadence Records, which guessed right on the mood of the nation, showing up the Manhattan giants. 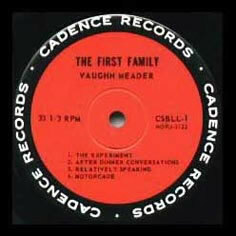 Cadence Records vinyl LP label. Meader with his popular comedy record.